The Pontcysyllte Aqueduct carries the Llangollen Canal over the valley of the River Dee in north east Wales. It is the longest and highest aqueduct in Britain, a Grade I Listed Building and a World Heritage Site. By the 1790's the rapidly growing industrial revolution required an efficient way to despatch the burgeoning local industrial product of the Wrexham and Ruabon area to the Midlands. Remarkable plans were hatched to build a canal over the river by means of a great aqueduct. 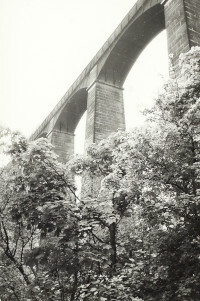 William Jessop and Thomas Telford worked on the design. Early plans for a low level aqueduct with locks on either side were were abandoned in favour of Telford's grand design: a cast iron trough mounted on stone pillars spanning the valley 127 feet below. It took ten years to build and opened in November 1805. It is as extraordinary a feat of civil engineering as you are likely to see anywhere in the world today.